Living in London definitely has its perks, with a wealth of shopping opportunities and amazing restaurants on your doorstep. But with this comes the hustle and bustle of city living, as our customer in Battersea soon found out! Battersea Rise, SW11, is one of the main roads running through Wandsworth and has the advantage of being near the very popular Clapham Common and the abundance of unique shops and little cafés on Lavender Hill. Being so close and well connected to the city is also a bonus but one that brings many commuters through the Battersea Rise, SW11 area throughout the day and night. Our customer was looking for Victorian style window shutters that would provide privacy for the house during the evenings that he spent in this office room, and decided that Shutterly Fabulous’ fantastic range of interior house shutters were perfect for his needs. Click here for another installation in Battersea. When this shutter customer was considering window coverings in his new house, shutters in the tier on tier design were the obvious choice as they offer flexibility in terms of filtering the light that is let into the room at different points of the day and also getting the privacy required with so many people walking past the window. White shutters with 64mm slats were chosen, along with the front pushrod to keep the design quite traditional and keep the décor of the house quite cosy. Tier on tier shutters allow you to open the top row of panels while leaving the bottom row closed, meaning that the room stays bright and sunny and prying eyes are kept at bay. These white coloured plantation shutters look great and are versatile enough to fulfil our Battersea Rise customer’s very specific needs. 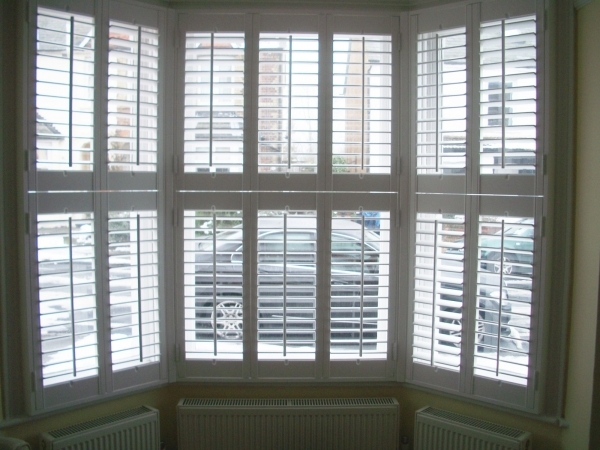 Why not call us at Shutterly Fabulous and ask how our Battersea shutters can suit your needs?